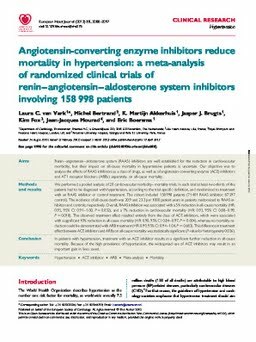 AimsRenin-Angiotensin-Aldosterone system (RAAS) inhibitors are well established for the reduction in cardiovascular morbidity, but their impact on all-cause mortality in hypertensive patients is uncertain. Our objective was to analyse the effects of RAAS inhibitors as a class of drugs, as well as of angiotensin-converting enzyme (ACE) inhibitors and AT1 receptor blockers (ARBs) separately, on all-cause mortality. Methods and resultsWe performed a pooled analysis of 20 cardiovascular morbiditymortality trials. In each trial at least two-thirds of the patients had to be diagnosed with hypertension, according to the trial-specific definition, and randomized to treatment with an RAAS inhibitor or control treatment. The cohort included 158 998 patients (71 401 RAAS inhibitor; 87 597 control). The incidence of all-cause death was 20.9 and 23.3 per 1000 patient-years in patients randomized to RAAS inhibition and controls, respectively. Overall, RAAS inhibition was associated with a 5 reduction in all-cause mortality (HR: 0.95, 95 CI: 0.911.00, P = 0.032), and a 7 reduction in cardiovascular mortality (HR: 0.93, 95 CI: 0.880.99, P = 0.018). The observed treatment effect resulted entirely from the class of ACE inhibitors, which were associated with a significant 10 reduction in all-cause mortality (HR: 0.90, 95 CI: 0.840.97, P = 0.004), whereas no mortality reduction could be demonstrated with ARB treatment (HR: 0.99, 95 CI: 0.941.04, P = 0.683). This difference in treatment effect between ACE inhibitors and ARBs on all-cause mortality was statistically significant (P-value for heterogeneity 0.036). ConclusionIn patients with hypertension, treatment with an ACE inhibitor results in a significant further reduction in all-cause mortality. Because of the high prevalence of hypertension, the widespread use of ACE inhibitors may result in an important gain in lives saved.